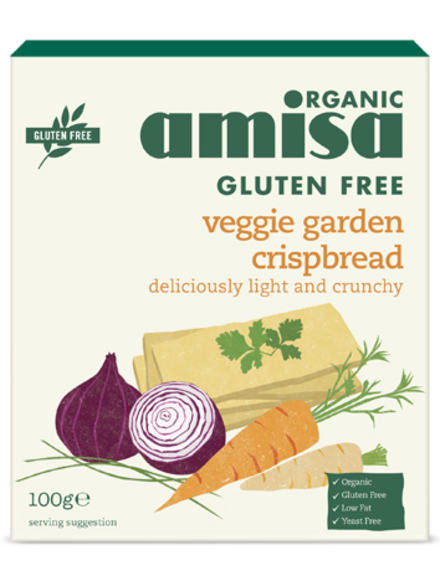 Veggie Garden Crispbread 100g, Gluten Free (Amisa) - HealthySupplies.co.uk. Buy Online. A light, yet filling crispbread. Low fat, rich in fibre. Only 24 calories per slice. Great for a snack or light lunch. Crumble into soup for healthy croutons. 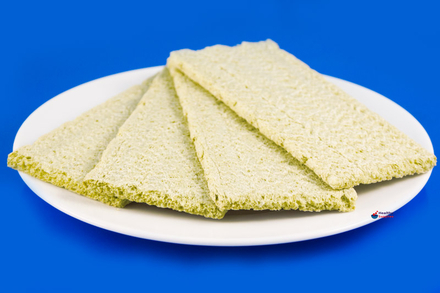 These crispbread style crackers are thick enough to accommodate a spread without breaking and are still light and crunchy. They contain rice flour, corn flour, pea flour and various vegetables which makes them naturally gluten-free with a rich savoury flavour. With only 24 calories per slice this is a useful alternative to bread for those on a weight loss diet or other health regime. Ideal for eating with dips such as salsa, houmous and guacamole. Rice Flour*, Corn Flour*, Pea Flour*, Dried Onion*, Vegetable Mix 1% (Parsnip*, Carrot*, Parsley*, Chives*, Lovage*), Potato Flakes*, Sea Salt. (*=certified organic ingredients).